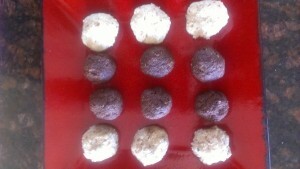 Raw Chocolate Macaroons | Get Krieger Fit! If you are using raw almonds instead of almond flour, place them in the bowl of a food processor and grind them until they are very finely chopped. Or if you make your own almond milk you can dehydrate the left over almond. Add the coconut to the ground almonds or almond flour, along coconut butter, maple syrup (or your choice of sweetener, vanilla extract and pinch of salt. Process until the mixture is well blended but still has plenty of texture. Form mixture into balls and place the macaroons on a cooling rack and dehydrate for a few hours – depending on your preferred texture. You can also refrigerate them until they are firm. For Chocolate Orange Macaroons: add 2 teaspoons of finely grated orange zest. For lemon or orange scented macaroons: add 1 ½ teaspoons grated lemon or orange zest to the mixture. This entry was posted in Healthy Recipies on August 3, 2014 by sabinekrieger@hotmail.com. What is Quinoa – grain or vegetable? Weight loss – what can I eat at night?